During a blackout, the body of a woman is found in the middle of the Oresund Bridge, between Sweden and Denmark. Half of it belongs to a Swedish politician, the other half to a Danish prostitute. Trapped in no-man’s land between the two countries, a bi-national investigatory team is put together to solve the murders. Martin, the laid-back family man from Denmark, and Saga, the socially awkward singleton from Sweden, soon realise that th..
During a blackout, the body of a woman is found in the middle of the Oresund Bridge, between Sweden and Denmark. Half of it belongs to a Swedish politician, the other half to a Danish prostitute. Trapped in no-man's land between the two countries, a bi-national investigatory team is put together to solve the murders. Martin, the laid-back family man from Denmark, and Saga, the socially awkward singleton from Sweden, soon realise that th.. The Bridge is a critically acclaimed and award winning Danish-Swedish co-produced crime drama series that has spawned multiple re-makes across the globe. Season One Sofia Helin stars as the iconic Swedish police detective Saga Norén who is forced to work with Danish counterpart Martin Rohde, (Kim Bodnia) when a body, cut in half at the waist, is discovered in the middle of the Øresund Bridge, which connects Copenhagen with Malmö, placed..
An old tanker veers off course, heading straight for the Oresund Bridge, the scene of the now-infamous crime that first united detectives Saga Noren (Sofia Helin) and Martin Rohde (Kim Bodnia). The Malmo Coast Guard urgently contacts the tanker but there is no reply, the call just echoes eerily across the bridge of the ship. When the Coast Guard finally board the ship they discover there is no crew present but find three Swedish and two..
A famous Danish gender activist and owner of Copenhagen's first gender-neutral children's nursery is found dead on a building site in Malmo, her body arranged in a macabre tableaux amongst a 'family' of mannequins. This marks the beginning of a line of spectacular murders that eventually become personal for Saga. Forced to work with a new Danish partner, who has difficulty accepting her for who she is, and having to deal with her past o..
A famous Danish gender activist and owner of Copenhagen's first gender-neutral nursery is found dead on a building site in Malmo, her body arranged in a macabre tableaux amongst a 'family' of mannequins. This marks the beginning of a line of spectacular murders that eventually become personal for Saga. Forced to work with her past once more when her mother unexpectedly arrives, Saga is put to the ultimate test both in her work and in he..
Saga and Henrik are brought together once again to solve a series of macabre and gruesome murders that start when a high-ranking government officer, the director general of the Immigration Service, is stoned to death. Increasingly, it appears that the murders have a personal connection with the Danish police team that Henrik is at the very centre of. In the midst of this fraught and complex case, Saga tries to make sense of her deepeni.. The Bridge is a critically acclaimed and award winning Danish-Swedish co-produced crime drama series that has spawned multiple re-makes across the globe. 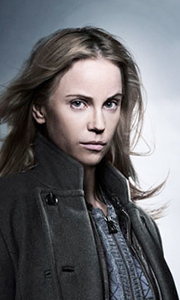 Sofia Helin stars as the iconic Swedish police detective Saga Noren who is forced to work with Danish counterpart, Martin Rohde, (Kim Bodnia) after the discovery of a dead body on the Oresund Bridge, which connects Sweden and Denmark. The socially challenged Noren develops a close, if ..